This little fellow is a guest of the studio tonight. It's an African Paradise Flycatcher. We were very surprised and entertained on Saturday to discover a nest with two babies in a tree where we were sitting in the studio garden. There were two babies in the nest and the parents were flying in with tasty bugs continously, undisturbed by the humans at close range. Here it is in its nest this morning. And here it is late this afternoon. You can see it in the middle of the picture, clinging on to a small twig for dear life. It is only about 1 meter above ground, in danger of predators and exposed to the elements. We had a storm with wind and icy rain. It either decided to leave the nest, or was blown out. For a while the parents brought it food and were frantically calling, trying to get it to move to a safer spot. When it became dark it was still on the same twig. The parents went to sleep in the top of the tree. I decided to intervene. It would definitely not survive the night out there. I quietly sneaked up to it and removed it without a peep. The parents don't know it's gone. It will be an early call for me tomorrow. I intend to get up at 4am and return it to the nest before sunrise. I'm sure its parents will be happy to find it back in the nest, and I will have a peaceful (short) nights sleep, at least not worrying that it is dying out in the cold. Hopefully tomorrow the sun shines and it can start with flying lessons! 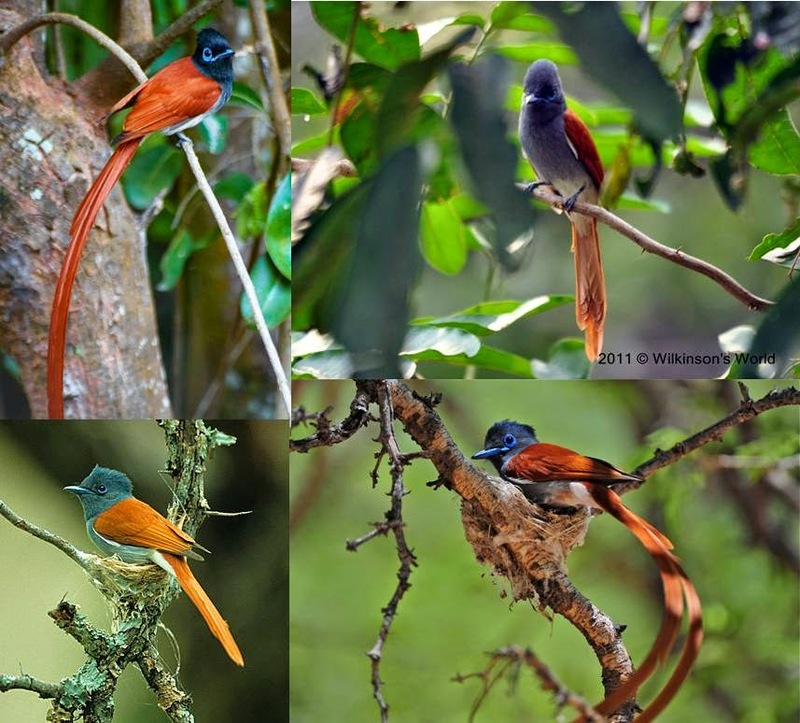 Paradise Flycatcher pictures borrowed from Google Images. Thank you for your caring nature. Please keep us posted. The little bird is doing well Joyce. It went to sleep on a low branch again last night and I brought it inside. Put it out at 5am and it's joined its parents for the day. I'm starting to think the low branch at bedtime thing is a ruse to have me bring it inside!